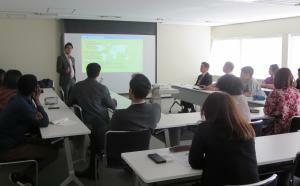 UNCRD held the first Mini-Seminar with twenty-two participants. This year, UNCRD plans to organize mini-seminars periodically, inviting speakers, such as professor and expert, in the area of regional development to facilitate a better understanding of topics relevant to UNCRD's activities and the Sustainable Development Goals (SDGs). As a main speaker of the first seminar, UNCRD invited Dr. Kenzo Hiroki who is Professor of the National Graduate Institute for Policy Studies (GRIPS); and Coordinator of the High-level Experts and Leaders Panel on Water and Disasters (HELP). His topic was on HELP which is established to assist the international community, governments, and stakeholders in mobilizing political will and resources in the field of DRR. Dr. Hiroki discussed HELP's efforts to raise awareness, ensure coordination and collaboration, establish common goals and targets, monitor progress, and take effective measures aimed at addressing the issues of water and disasters. The second speaker was Ganesh Raj Joshi, UNCRD Researcher. He made a presentation entitled, "Role of Environmentally Sustainable Transport (EST) for Making Cities and Communities More Resilient, Livable, and Sustainable". The EST Forum is the inter-governmental forum in transport sector, and UNCRD has been organized the forum annually since 2005 to facilitate high-level policy dialogues on environment and transport issues. 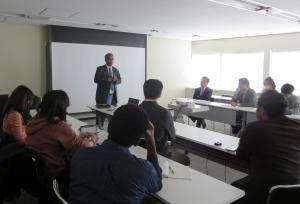 Joshi discussed on rapid urbanization, modernization and natural disasters, and climate change.